St Mary's church Throwleigh apparently dates back to the13th Century. The first recorded rector was in 1248, but most of the present church dates fromthe 15th and 16th centuries. It has some interesting wooden carved roof bosses in the North Aisle. One of the three hares and one of the green man. The image of the three hares is found in a number of Devon churches. The three hares are joined by their ears and are said to represent the holy trinity. The hare was also believed at one time to be able to conceive without a mate giving it an affinity with the Virgin Mary. The green man (a man's face surrounded by leaves and branches) is often found carved in wood or stone in medieval European churches and cathedrals, and is usually interpreted as a symbol of rebirth or the cycle of growth each spring. In the 20th Century the symbol has become more associated with folk traditions and has been interpreted as an ancient pagan spirit of nature. However it is unlikely that an image with this meaning would have been included prominently in the building of a church. Our walk then took us through the church yard and past an huge old Oak tree, through an orchard with grazing sheep and a small sign explaining the principles of forest gardening and then on through two very muddy small fields to join the road skirting the moor. We climbed up a steep track and picked up a fairly major path, persevering until we reached the triple stone row just to the left of Cosdon Hill. This stone row was apparently partially restored in 1896 and put under the protection of the local land owner (Charles Farsdon, Esq., as lord of the manor of South Zeal). Taken together, the configuration of stones is impressive but none of them is large and so they were very vulnerable to being moved and used for local walls and gateposts. Stone rows are thought to date from the Bronze age i.e. around 3000 BC and to have been connected to ceremonies or burials. However another theory is that each new generation added an additional stone to the row. 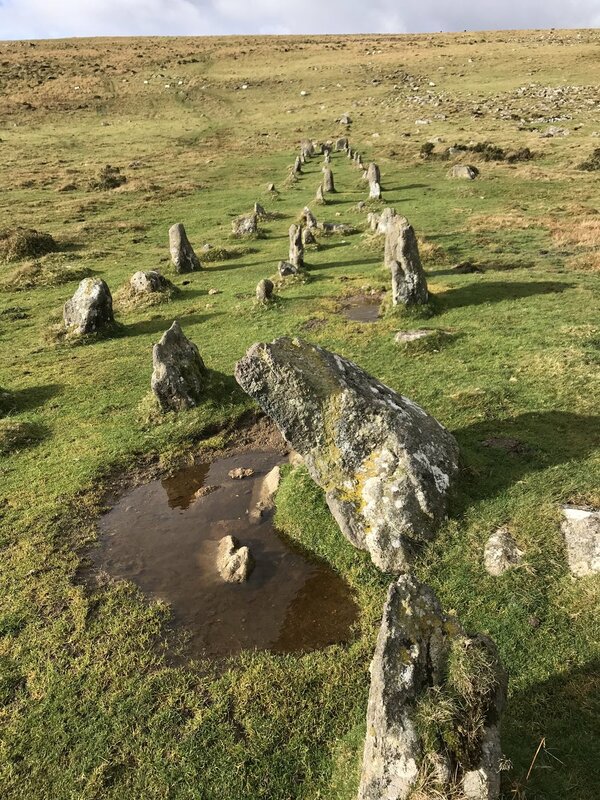 There are a total of around 71 Stone rows on Dartmoor. From the stone row nestling on the East side of Cosdon Hill, we headed back down hill and explored the possibility of crossing Blackaton Brook. However the water was too high for the ford or stepping stones to be manageable, so we headed back down a bridleway to rejoin the road from Great Ensworthy to Week, and then on back to Throwleigh.